As I wrote a couple weeks ago, ancestor veneration is a part of many faiths, including several branches of Paganism. 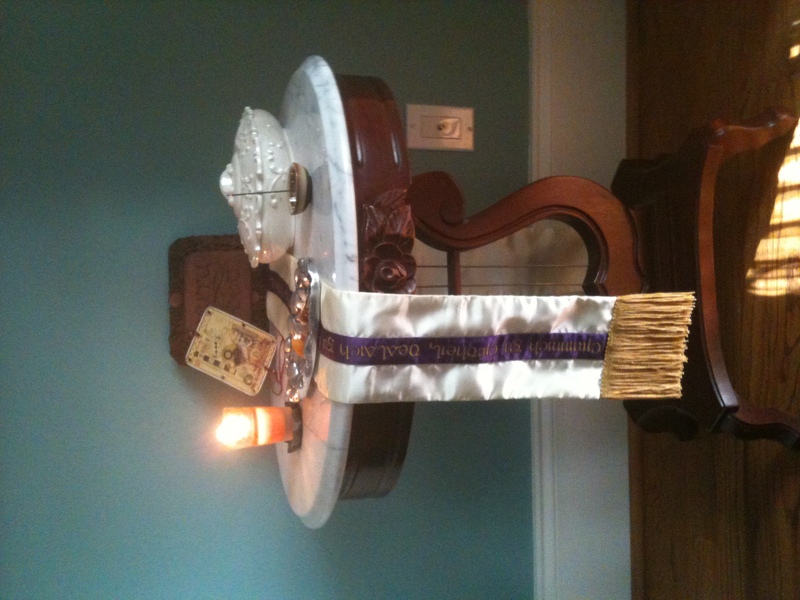 Anyone can set an altar up, and for a lot of people, myself included, regularly renewing our connection to the past through the practice of ancestor veneration is not only comforting, but powerful. Ancestors are there to listen, to give advice and assistance (sometimes through simple contemplation and sometimes through dreams), to help us gain our focus, and to be our champions through times both easy and challenging. 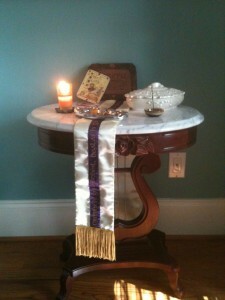 Setting up an altar is simple. You just need a flat surface that’s safe to put candles or incense on. * Add mementos – pictures, statues, knick-knacks – that remind you of your family line. For example, I have a dish that my grandmother always had filled with Werther’s Caramels and offered to my sister and I whenever we arrived at her house. You don’t need an item for every person, just a few things that are significant. Different faiths believe different things regarding whether or not it’s appropriate to put people not actually in your family on the altar, so I’ll leave that part up to you. Personally, I currently only consider members of my and my husband’s families to be the focus of my practice, but some people include significant historical figures or other people for a host of reasons. Regardless of how you’d like your altar to end up, I recommend starting small as you get used to the practice instead of naming everybody in history you ever admired; it would be easy to feel overwhelmed instead of inspired. After you’ve decided who you’re venerating and set up symbols for them, set up an offering space. A dish for sharing food and a holder for lighting candles or incense are common. While ancestors are not gods (at least most of us don’t see them that way**) they are worthy of our respect, and we show that with an offering of fire and/or food. Sharing food is important, in my opinion, because it helps us, as practitioners, focus on the conversation with the spirit of camaraderie. It’s sharing a meal. Got your symbols and your offering space? You’re set up! How you proceed with the actual veneration is up to you, but I’ll share what I do. I recommend following this or something else that strikes your fancy as a loose guideline and deviating from it until you find what works best for you and your ancestors. Just as each family is unique, each practice should be unique and reflect you and the history you are celebrating. But here’s what I do as an example. On Monday mornings after TheScott has gone to work (the poor man is allergic to incense so I don’t do this while he’s home), I make a cup of tea with breakfast. I portion out small pieces (less than a dime sized) of everything on my plate onto the offering dish along with a few drops of tea. I light an incense stick for my ancestors. I also make an offering to our tomte*** (house sprite) at the same time by lighting a candle to him/her. Some people think these rituals should be kept separate, but I prefer looking at us as one big, happy spiritual family, so I venerate everybody together. Together we labor in joy and in frith, and together the harvest we’ll taste. Offerings out, I draw a rune from my rune bag as a focus for the week and read the associated rune-poems (this is very Heathen of me and wouldn’t be done as part of ancestor veneration for non-Heathens). Then I eat my breakfast. During the meal I talk to my ancestors about major things going on in TheScott and my lives and tell them what we’re working on this week. If we need specific help with something (usually involving luck) I’ll write a short note about what we need help with and why it would be good for the family as a whole. The note goes in the candy jar until the luck comes through, at which point I burn the paper. I’ve never asked for more than one thing at a time. If you decide to do something like this, you can make your own rules for how much you ask, just remember that your ancestors are there to help those who help themselves, not chauffeur you down Easy Street. Next I go over my commitments for the week and my schedule for the day. I also set personal goals for the week and ask for guidance from the disir and the tomte as I work on them. Usually by this point the incense stick has burned out, so all that’s left is to blow out the candle. The food stays on the altar for now and is later tossed outside into the garden with the incense ashes (at least wait until the next morning). Now I can go about my day (and my week) feeling confident in my planning and knowing that I have a host of ancestors and spirits supporting me as I go! Does anybody else practice ancestor veneration? I’d love to hear what other people are doing! * If fire of any kind is not allowed in your building or you don’t have a safe place to light candles, you don’t need them, but do make sure you have an offering dish. ** I’m sure there’s somebody out there who sees ancestors as gods because there’s somebody out there who believes pretty much anything you can imagine, but this isn’t common. *** This is definitely Pagan. Tomtes, also known as nisses, brownies, kobolds, and a bunch of other names, are the house elves or spirits of a home that either cause mischief or help keep the household running smoothly depending on their moods. Making offerings to the tomte is a way of helping ensure s/he stays happy. J.K. Rowling based the character Dobby on this type of being, although unlike in the Harry Potter novels, we Pagans don’t think of our house elves as servants (and, *sigh*, they don’t do our housework for us). + This initial half-line, oddly enough, took me the longest to write. I had written some other greeting initially, but I couldn’t for the life of me remember it (I could remember the rest of the poem, just not how I’d started it and had to read the first line from my journal every week). I finally decided that my ancestors (and maybe the tomte) were expressing their displeasure by interfering with my memory, and rewrote it to use the more Heathen greeting of “Hail.” I have had zero problem remembering it since the change. Previous postThanks for the Memories Next postStar Trek's Seven Life Lessons: How do the Pagan Princesses Measure Up? That’s beautiful, AJ/Melia. Thank you for sharing! I just recently started adding in ancestors and land/house spirits. 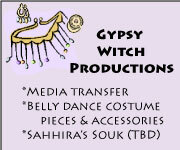 I began at Samhain–I wanted a “starting point”–and I feel it’s very beneficial. Like it adds a tangible, real focus to what I do. I also like to remember–remembering, telling stories, etc. is important to me. Would you be capable of guidebook us on your website owner or perhaps the guy whom looks after your website, I must determine it could be easy to be a guest poster.